Roseanne was cancelled for a number of reasons related to the show’s title actress that we’d rather not discuss here, but the fact of the matter is that the series will leave a pretty big absence for another show to fill. Currently, an unlikely candidate has surfaced: Marvel’s New Warriors adaptation, which was originally meant to air on FreeForm before being moved away from there for another network to pick up. The pilot to New Warriors apparently tested well, so the show will get made; the question is where we’ll see it. ABC is one option, but the problem with it is that the network has previously given a cold shoulder to Agents of S.H.I.E.L.D. (which just narrowly got renewed for a sixth season), leading to the perception that they aren’t interested in Marvel shows. In spite of their apprehension over S.H.I.E.L.D., however, rumors have also indicated that ABC would like to have a Marvel presence on their network. Forbes writer Merill Barr (no relation to Roseanne Barr) came up with a fairly-easy solution to their Roseanne problem: have New Warriors take its place. A big reason why the revival had a lot of appeal outside of that demographic is that it also featured a diverse supporting cast and represented a number of different backgrounds. With the ten-episode run of New Warriors already in development, the Forbes piece argued that the simplest solution would be to have it take the show’s place on Tuesday nights, and that the diversity of the cast (made up of male, female, black, white, Asian, and LGBT characters) could seize the interests of people who watched Roseanne. How about putting an African American woman with telekinetic powers on?! Highly trained African American Ninja?! 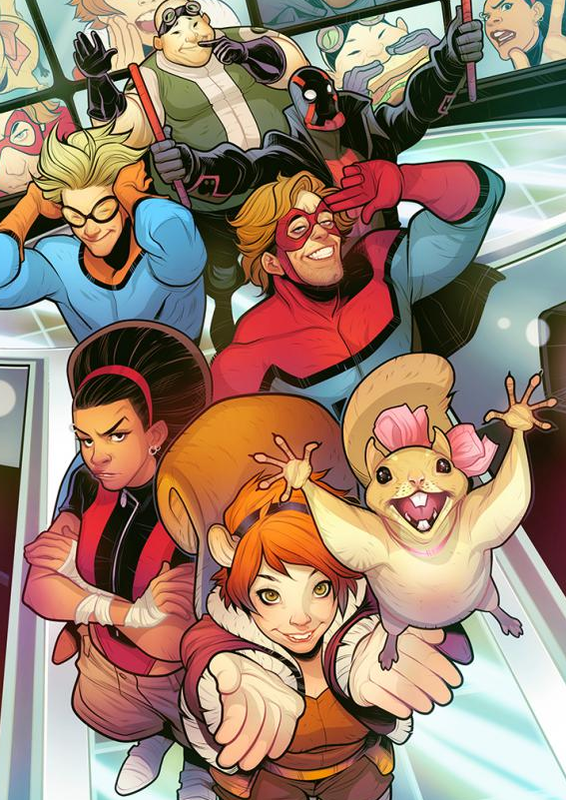 Team them up with Squirrel Girl, Mister Immortal, Speedball and Microbe?!! ABC would be an ideal place for the series to call home, as Disney’s streaming service won’t launch until next year. The show’s ready to go at this point and the top brass clearly liked it, so this seems like the easiest solution for ABC to make in the face of the sudden cancellation of one of the network’s biggest hits. New Warriors is set to air sometime in 2018 on an as-of-yet undecided network. Starring a team of young, rookie superheroes made up of Craig Hollis/Mister Immortal (Derek Theler), Dwayne Taylor/Night Thrasher (Jeremy Tardy), Robbie Baldwin/Speedball (Callum Worthy), Zach Smith/Microbe (Matthew Moy), Deborah Fields/Debrii (Kate Comer), and Doreen Green/Squirrel Girl (Milana Vayntrub), New Warriors takes a slice-of-life approach to their attempts to become worthy superheroes, even if they’re far from ready to become Avengers (think Spider-Man: Homecoming, but as a weekly comedy). The series will be the first half-hour show set in the Marvel Cinematic Universe.